I flew the quad in the simulator this weekend trying to tune the rate PIDs. First problem is the D factor which is very sensitive to sensor noise. For this I added a butterworth filter with a 5Hz cutoff. I’ll probably need to tune this later. Next problem is that my motor mixing doesn’t preserve total thrust, but instead tries to preserve angular velocity. Rookie mistake I presume. Motor 1 is towards the front of the quad, 2 to the right, 3 is in the back and 4 to the left. As you can tell from the picture, diagonally opposite motors spin in the same direction – so 1 & 3 spin clockwise while 2 & 4 spin counter-clockwise. If all motors were spinning in the same direction, the whole quad would start to spin in the opposite direction to counter the rotation of the motors. For this reason the motors spin the way they do – to counter this effect. Now if the quad wants to go forward, it runs motor 3 faster and motor 1 slower causing it to tilt forward. This will get it to accelerate forward as some of the downward thrust goes backwards now. Same for going left, right and backwards. If the quad wants to rotate clockwise, it spins motors 2 & 4 faster than motors 1 & 3. 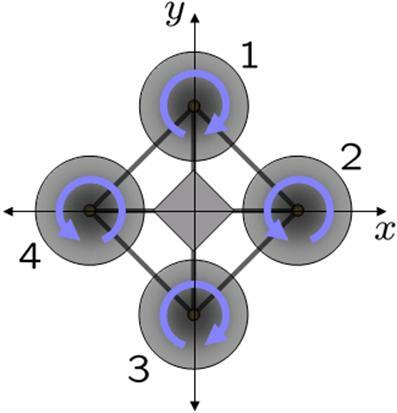 This causes the quad frame to spin in the opposite direction than motors 2&4 – so clockwise. If a motor goes above max (100%), distribute the spill to all other motors. Same when going below min (5%). Turns out this doesn’t preserve total throttle, but it does preserve angular velocity. As a consequence sometimes my quad would fly away even at min throttle. It gives me a very accurate rotation with very little drift – if the sensor is properly calibrated. Where mu is the interpolation factor. Initially I used 0.01, big enough to compensate for gyro drift and gyro cross-axis winding and saturation. But it’s too big and the m_local_to_world quat catches a bit of accelerometer noise. The 0.001 is big enough to compensate for idle drift – but not too big. The av is the gyro rate sample – so the bigger the rotation rate, the bigger the mu.